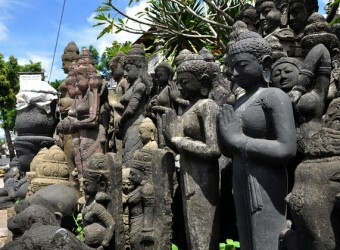 You will past this famous stone carving village, Batublan Village on the way to Ubud. The name means "Batu = Stone" and "Bulan = Moon". You will be amazed of stone carvings on the both sides of the streets. The village is also famous for Barong& Kris Dance. There are various status such as Hindu God, Buddha and goddess. Batubulan Village is a village which is famous for its sculptures and stone carvings. A variety of sculptures are displayed along the road of the village. It is fun to see it. I could not buy a big stone sculpture, I bought small one. With the stone sculpture I bought, my room will be a little Bali style.